Last month, Melbourne indie-rockers Plotz returned with their first new music since 2017 and they’re back again today with a brand new clip - on ‘Baby Shakes’, they serve up a dose of easy-going jangle-pop and the new video takes the track’s laid-back vibes up an extra notch. Since the release of their debut EP in 2015, Plotz have been impressing local audiences with their mixture of lo-fi indie rock and blissful psychedelia, and their captivating live show, thanks to enigmatic frontman and project mastermind Yonatan Rotem. The release of ‘Baby Shakes’ last month marks the next chapter for the band, as they gear up to release their second EP and hit the road with a new lineup. To accompany the single is the brand new clip which finds Plotz out and about on a perfect day, hitting the streets in their own “bandwagon”, between shots of them serenely performing the track in the sunshine. Yonathan explains ”The video was very much in line with the idea of contrasting the darker lyrics with a bright sunny and colourful day. We chose to film at our favourite parks and gardens around Melbourne, as we felt we should represent our current home town. We felt like the song has a sunny vibe so we chose a sunny day, and our main goal was to have fun and make a fun video." 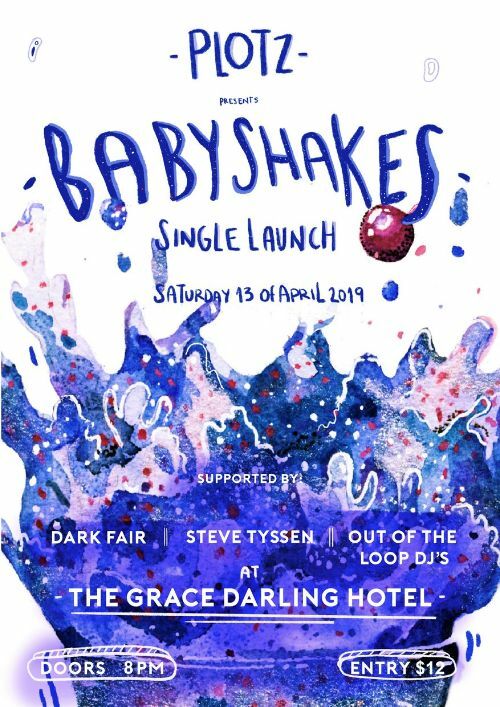 To celebrate the new track and clip, Plotz are launching ‘Baby Shakes’ at the Grace Darling on Saturday April 13th, joined by Dark Fair and Steve Tyssen. Check out the clip for 'Baby Shakes' above, and catch Plotz launching the new single on April 13th at the Grace Darling.